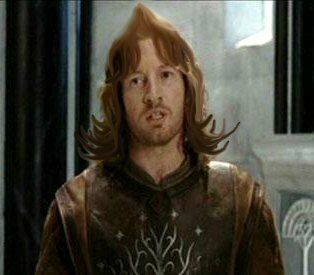 Faramir with "Gondorian helmet head" after a hard day's campaigning. Moments after this photo was created, alert fans remarked upon the hairstyle's resemblance to an Oompa Loompa, the odd little green-haired creatures from Willy Wonka and the Chocolate Factory. This resulted almost immediately in the photo below. 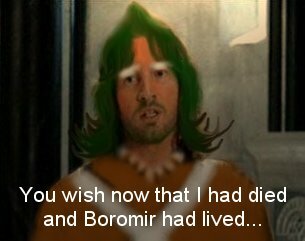 Photos copyright © 2004 Lady Wenham.